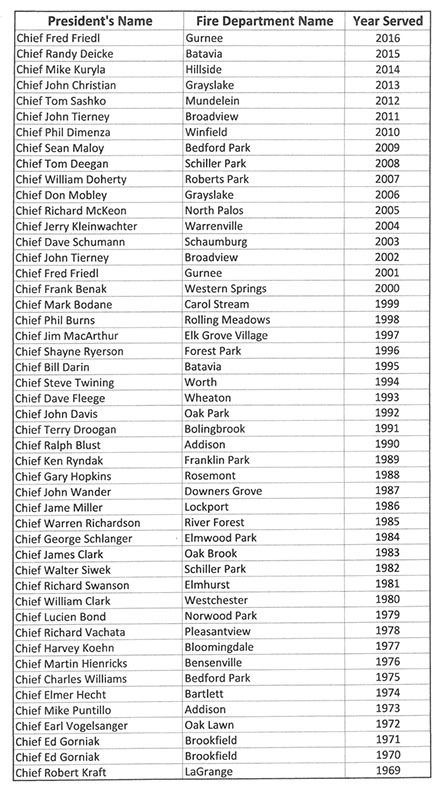 The Metropolitan Fire Chiefs Association was born during a meeting (discussion) of Chief Robert Kraft, LaGrange FD, Chief Ed Gorniak, Brookfield FD, Chief Mike Puntillo, Addison FD, Chief Leo Musch, Hinsdale FD, Chief James Cote, Broadview FD, and Chief Earl Volelsanger, Oak Lawn FD. This group met numerous times in the late 1960’s to discuss the need for a new defined type of organization as experienced by certain major suburban incidents that had taken place in collar counties and had overwhelmed the resources of the West Suburban Firemen’s Association. After numerous meeting and discussions, it was decided to form a more formal organization and Chief Kraft was selected as the first unofficial president of the group. He was to spearhead the discussions and information to be disseminated to the fire organizations in Cook, DuPage, Lake, Kane and Will Counties. There was numerous gatherings during the latter part of 1968 and early 1969 and committees were formed to prepare by-laws and operation procedures in preparation of a formal election to select the first official elected officer group and board of directors. 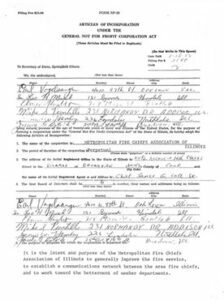 At this time additional Chiefs had started attending the informational meetings and Chief Elmer Hecht, Bartlett FD, Chief George hammy, Northlake FPD, and Chief William Vrtis, Forest Park FD joined the group to start formalizing and register the organization in the latter part of 1972. A formal posted meeting was called for the first Thursday of November 1969 hosted by Chief Henning of McCook with ChiefRobert Kraft of LaGrange at the Millionaires Club on North Avenue in the Winston Plaza in Melrose Park. The attendance was overwhelming and copies of the proposed by-laws and a roster of officers for the formal organization was brought forward, discussed and approved to be placed on the agenda for the December meeting to again be held at the Millionaire Club in Melrose Park. 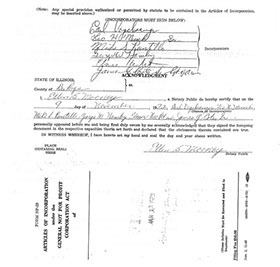 In December 1973, the official first elected board of the organization signed the original application of Articles o Incorporation. It was signed by President Chief Earl Vogensanger, Oak Lawn FD, Vice President Chief Elmer Hecht, Bartlett FPD, Secretary Chief Leo Musch, Hinsdale FD, Chief Mike Puntillo, Addison FPD, Chief George Hammy, Northlake FPD and James Cote, Broadview FD. The actual first Certificate of Incorporation was issued by the Secretay of State, Michael Howlett on January 18, 1973. 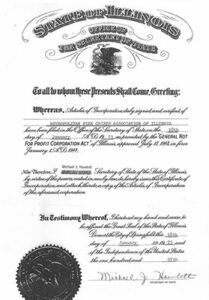 This allowed for formal aide agreements to the considered and provided official recognition of the organization by the State of Illinois, the various county governments and the local jurisdictions. As time went on each individual county formed their own Fire Chiefs Organizations to allow for better understanding on a county basis. Things moved forward now on a more stable basis for training and in 1979, the Board of Directors in conjunction with the Illinois Fire Chiefs Association it was decided to plan an annual Metropolitan Fire Chiefs Association symposium for those that were not able to attend the IFCA annual symposium held in Peoria int eh spring of each year. It was decided to hold the first Metropolitan symposium in the fall and the first one was held at the Elmhurst Holiday Inn in the fall of 1979. Attendance was overwhelming and far exceeded expectations. The conference was scheduled for 2 days, Thursday and Friday from 8:00am to 4:00pm with scheduled speakers in the morning, then lunch was served and then open forum in the afternoon with the morning speakers available for questions and discussion. 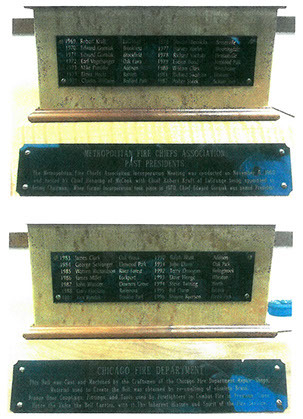 In early to mid 1990 discussions were to place the Northwestern Fire Chiefs Association as members as participation at there monthly meetings was dwindling tremendously and in discussions with their president, Tim McGrath and Board of Directors, it was decided that they would continue the Northeastern Fire Chiefs Association and all of those members would then become Metropolitan members. 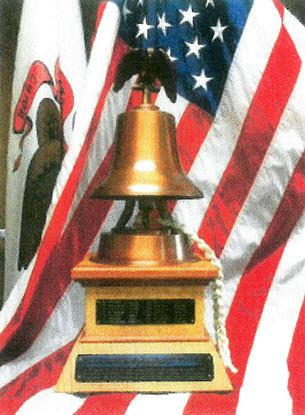 this was done at a meeting held on or about 1998 in Mundelein at a joint meeting. After a detailed discussion, a vote was taken and by a unanimous vote it was decided to dissolve the Northeastern Fire Chiefs Association. In the early 1980’s it was determined that it was time to move forward some type of financial assistance for advanced education for firefighting personnel. This led to the creation of the annual gold outing.